After preparing this dish and sharing with my snap chat friends (xolaurensnaps is where you can find me) I knew I had to share this recipe with you all! This recipe is an adaptation or copy cat recipe for the super popular bang bang shrimp from Bonefish Grill. Season shrimp with old bay. Combine in a bowl, mayo, sweet chili sauce, and sriracha. Dredge shrimp in cornstarch and fry for 5-6 minutes. Toss shrimp in sauce and served over lettuce topped with scallions. October is a HUGE month for us! All four of our birthdays are in October so its always a great time! This year Alexander turned ONE! We hosted family and friends for a Safari themed birthday bash. His cake was purchased at Sam’s Club. I added the animal figurines (purchased from Michael’s) We had a hot dog bar, nacho bar, mini spaghetti cups, and lots of sugary treats for the children. The party goers enjoyed having their faces painted as well as creating their own jungle masks. It was a great time! Chandler turned 3, we enjoyed a quiet day at the park (of course there was cake) followed by pizza. Since we decided on a intimate celebration I created balloon memories for him to wake up to! I simply printed images from birth-now and attached them to ballons! DeAndre and I both turned 29 and we celebrated at our friends 80s themed birthday bash! We especially loved dressing up and had a great night away from the children! We attended Harvest Fest at our church. We came dressed up as Milk & Cookies! It was a hit. I hand crafted each of our costumes, with the exception of the milk mask. It took me in total, 16 hours to complete. I simply used light brown felt, dark brown felt, black ribbon and pillow stuffing. I’m far from a seamstress, but I figured it out and conquered! With Christmas right aroud the corner I am excited to create our ugly Christmas sweaters! Lately I have been all about sweet and spicy sauces. And this one is AMAZING! Heat frying oil to 375 degrees. Clean and season chicken with salt and pepper. In a seperate bowl combine Sriracha, honey, soy sauce, lime, garlic, and a sprinkle of salt and pepper. Fry chicken until golden crisp. 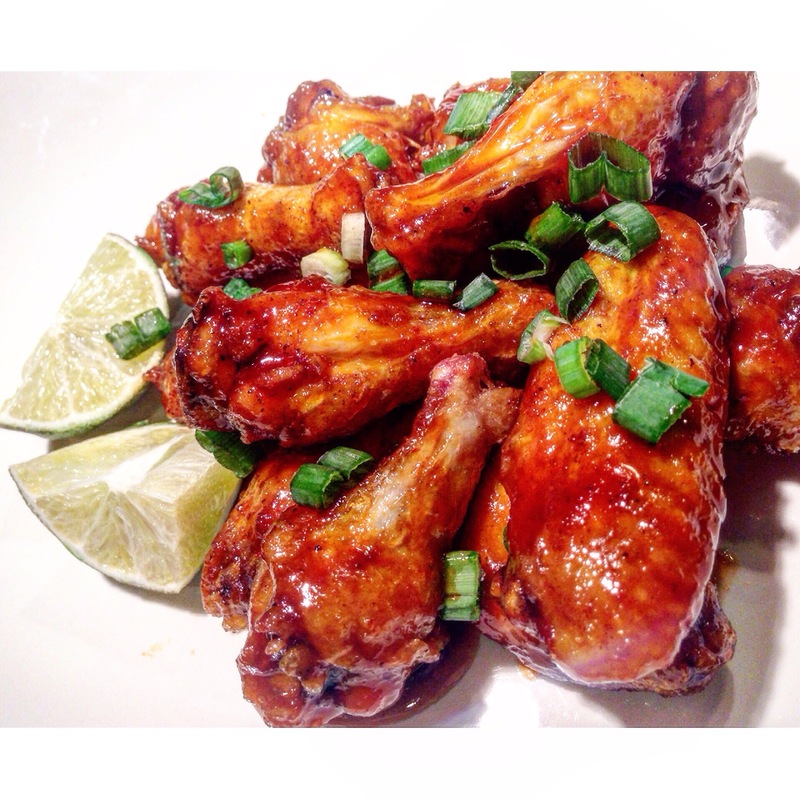 Toss wings in sauce as soon as they are out of the grease!